Image credit: Franconia Brewing Company (click to enlarge). In May of this year, the Franconia Brewing Company released the final beer in a series of brews created to celebrate its fifth anniversary in 2013. The beer was dubbed the Tripel Dunkel, and it took the brewery's standard Dunkel and turned it on its ear. Not only was it fermented with a Belgian yeast strain, to provide added dark fruit complexity, the grain bill was bumped up to add more fermentable sugars allowing the alcohol percentage to reach 10.4%. Like Franconia's Double IPA, another of the anniversary brews, Tripel Dunkel was originally intended to be a one time only release. However, the beer will return this November in more ways than one. Around Thanksgiving, fans of the brewery will be able to pick up the Amazing Tripel Dunkel (as per the attached product label) in six-packs of 12-ounce bottles for the first time. Prior to that, though, will come a version specially created for NTX Beer Week. Bordeaux Aged Tripel Dunkel gets its name from taking the base beer and aging it on French Oak. The treatment adds distinctive wood tones and a light vanilla flourish to the finish of the beer, complementing not only the chocolate and roasted malt overtones, but the underlying fruit from the yeast as well. variations (credits: Taverna Rossa, Franconia Brewing Company, click to enlarge). Your first chance to try the Bordeaux edition comes on Saturday, November 1, at Taverna Rossa in Plano. The craft beer and pizza parlor will tap it during their 1-Year Anniversary Shin-Dig, which will feature an expanded patio area converted into a Franconia Brewing Company Beer Garden. As an added incentive to attend this event, all proceeds from sales in the beer garden will benefit Minnie's Food Pantry, a charity which helps feed the hungry in Plano. 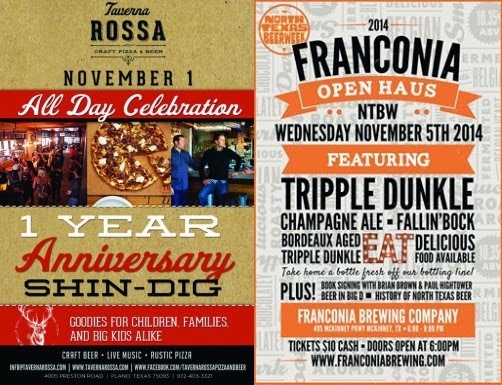 Should you miss out on the debut, a second chance happens during Franconia's 2014 Open Haus on Wednesday, November 5 from 6-9 p.m. Put on in association with NTX Beer Week, the festivities will include tappings of both the regular and Bordeaux Aged Tripel Dunkel, the brewery's seasonal Fallin' Bock (also available in bottles for the first time this week) and another holdover from the anniversary series, Champagne Ale. Plus, I'll be in attendance along with co-author Paul Hightower to sign and promote our new book North Texas Beer: A Full-Bodied History of Brewing in Dallas, Fort Worth and Beyond. Tickets will be $10 cash, at the door.